Reverse Osmosis technology was developed in USA in the 1970-ies , and is now commonly used across homes and industries around the world. It is constantly improving, every few years a new twist or better membranes appear that significantly improve system cost and power consumption. Picture 1. Typical Whole House Reverse Osmosis System. The idea behind an RO system is a semi-penetrable membrane that splits water feed into two different streams, one clean and one "dirty". The "dirty" stream, containing majority of the contaminant, is then discarded down the drain, and clean water is processed further in order to get it to a state that would be fine to feed into a home or commercial building's plumbing system. The incoming feed water needs to be properly prepared. Contaminant such as chlorine and high mineral content are removed to preserve the membrane(s). Then water fed through a vessel(s) with the membranes under pressure to push H2O molecules and very little else through. Reverse Osmosis membranes reject, typically , 95%-98% of contaminants. 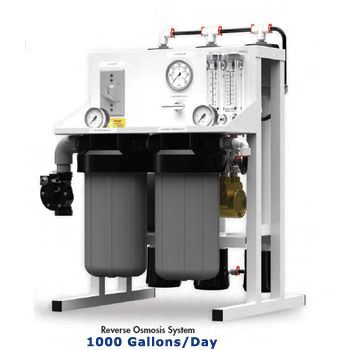 RO Systems are ranked based on how many Gallons Per Day (GPD) they can produce. While small under sink systems typically range in 50-100 gpd, a larger Whole House and Light Commercial RO Systems start at 500 GPD, 1000 GPD and range up to 7000 GPD. Bigger Commercial Systems can produce 10,000 GPD and more. Currently there are large plants in production that produce enough water to supply cities with population of a half a million people. Why So Much Water for the House? Let's say , a system produces 1000 gallons per day (GPD). It is less than 1 gallon per minute, a trickle. Not enough to have a shower , flush toilets and run a small home , let alone a business. That's why whole home systems like this require either a larger GPD capacity, or a storage tank from which water will be drawn , and which will be refilled while system is idling.